With winds of up to 155 miles an hour, Hurricane Michael hit the Florida Panhandle last week with a force that took some by surprise. It was the first Category 4 hurricane to ever hit the region, and went on to kill at least 17 people in Florida, Georgia, North Carolina and Virginia, according to the Associated Press. 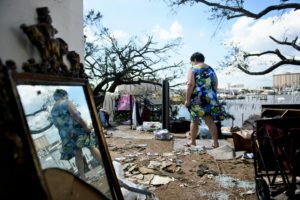 In the town of Mexico Beach, Florida, where the hurricane made landfall, entire blocks of homes were completely destroyed by storm surge and high winds. Power companies are working to restore service to about a million customers across four states, but the Federal Emergency Management Agency has told residents to expect extended power outages. It is estimated that the hurricane caused about $8 billion in insured losses from damage to homes, businesses and vehicles. Florida Disaster Fund. The state is accepting donations to this fund activated by Gov. Rick Scott when Hurricane Michael made landfall. It’s set up to assist in the response to and recovery from emergency or disaster. Text the word DISASTER to 20222 to make a $10 donation or donate online here. Volunteer Florida, the organization that administers the fund, is also looking for volunteers. GoFundMe has compiled a list of verified campaigns that are raising money to help those impacted by Hurricane Michael. The American Red Cross has deployed hundreds of trained disaster workers to provide food, health services and emotional support to those affected by the hurricane. Text the word MICHAEL to 90999 to make a $10 donation or donate online here. Global Giving, a global crowdfunding community, is raising $2 million to go towards initial relief efforts as well as longer term recovery efforts by local, vetted organizations. Contribute to the relief fund here. The Red Cross highlighted a “critical” need for platelet and blood donations in the wake of Michael. Make an appointment on its website, through its blood donor app, or by calling 1-800-733-2767. OneBlood, a local nonprofit center in Florida and most of the Southeast, is encouraging eligible blood donors to donate blood here. Florida Urgent Rescue, Inc., a nonprofit based in Jacksonville, is helping evacuate dogs and cats impacted by the Hurricane in partnership with Delta Airlines and Paws Humane Society. It is accepting donations here. The Humane Society of the United Statesruns an Emergency Animal Rescue Fund to help rescue, care for and provide temporary shelter to animals in need. Donate to the fund here. Bear Creek Feline Center, a refuge for wild cats near Panama City, Florida, sustained $100,000 worth of damages that will take an estimated six months to repair. Donate here. AirBnb is looking for homeowners in areas affected by the hurricane including parts of Florida, Georgia, South Carolina, North Carolina, Virginia and Alabama to provide housing for relief workers and people who have been displaced. Learn more here. Editor’s note: An earlier version of this story misidentified Bear Creek Feline Center due to an error on Charity Navigator’s compilation of charities.